Length x Width Georgia is 300 miles long and 230 miles wide. Explanation The geographic center of Georgia is located in Twiggs County, 18 miles SE of Macon. Borders Georgia is bordered by Tennessee and North Carolina in the north. In the south, Georgia bumps into Florida. To the east of Georgia is the state of South Carolina and the Atlantic Ocean. In the west Georgia is bordered by Alabama and a small section of Florida. Total Area Georgia covers 59,441 square miles, making it the 24th largest of the 50 states. Georgia comes pretty close to being an "average" size state. Land Area 57,919 square miles of Georgia are land areas. Water Area 1,522 square miles of Georgia are covered by water. Highest Point The highest point in Georgia is Brasstown Bald at 4,784 feet above sea level. Check out the view from Brasstown Bald with the U.S. Forest Service's Web Cam. Brasstown Bald is also called Mount Etonah. Lowest Point The lowest spot in Georgia is at sea level where Georgia meets the Atlantic Ocean in the east. Mean Elevation The Mean Elevation of the state of Georgia is 600 feet above sea level. With the largest land area of any state east of the Mississippi River, the Georgia landscape runs from the mountains in the north and northeast to the coastal plain in the southeast. The most southerly of the Blue Ridge mountains enter Georgia in the north and northeast. The central piedmont extends south and southeast from the mountains and levels to a coastal plain and coastal flatlands. Atlantic Coastal Plain: The Atlantic Coastal Plain is part of the Atlantic Plain that stretches from Massachusetts to the Florida peninsula and around the Gulf of Mexico. The Atlantic Coastal Plain lies in southeast Georgia along the state's Atlantic Ocean shoreline. Occupying about 1/4 of Georgia, the Atlantic Coastal Plain is characterized by a flat landscape. The Okefenokee Swamp lies in the southern part of the Atlantic Plain and in part of the East Gulf Coastal Plain. The rivers in the Atlantic Coastal Plain drain into the Atlantic Ocean. East Gulf Coastal Plain: The East Gulf Coastal Plain covers almost 1/4 of Georgia in the southwest. Similar to the flat landscape of the Atlantic Coastal Plain, the flat East Gulf Coastal Plain's soil is less sandy. Part of the Okefenokee Swamp lies in the East Gulf Coastal Plain. The great Suwannee River, like all rivers in this land region, flows south into the Gulf of Mexico. Piedmont: Northwest of the Atlantic Coastal Plain and the East Gulf Coastal Plain, the Georgia Piedmont cuts across the state. The Piedmont is marked by a hilly landscape in the north where it abuts the Appalachian regions at around 1,500 feet above sea level. The land loses elevation to the southeast, where the hills become more gently rolling and the land is only about 400 feet above sea level. The clear difference in landscape where the southeastern edge of the Piedmont meets the Atlantic Coastal Plain and the Gulf Coastal Plain is called the Fall Line. It is along this line that the rivers flowing from the higher elevations of the Piedmont fall to the lower Coastal Plains forming waterfalls and rapids. Blue Ridge: A small section of the Blue Ridge is found in northeastern Georgia north of the Piedmont. The mountain peaks in the Blue Ridge area rise 2,000 to almost 5,000 feet above sea level; more than 20 above 4,000 feet. These mountains are forested with hardwoods and pine softwoods. The rushing rivers in the Blue Ridge provide hydro-electric power to Georgia. Georgia's highest mountains are found in the Blue Ridge area, including Brasstown Bald, or Mount Etonah, which rises 4,784 feet above sea level. Appalachian Ridge and Valley Region: The Appalachian Ridge and Valley Region in northwestern Georgia consists of a series of broad, fertile valleys separated by parallel ridges of sandstone. 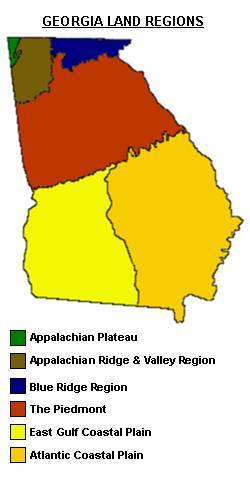 Appalachian Plateau: Isolated to a small piece of Georgia in the extreme northwestern corner of the state, the Appalachian Plateau stands about 1,800 to 2,000 feet above sea level and consists of narrow valleys and wooded ridges. Lookout Mountain and Sand Mountain are found in this region. Highest Temperature The highest temperature recorded in Georgia is 112°, Fahrenheit. This record high was recorded on July 24, 1953 at Louisville. Lowest Temperature The lowest temperature in Georgia, -17°, was recorded on January 27, 1940 at CCC Camp. Average Temperature Monthly average temperatures range from a high of 92.2 degrees to a low of 32.6 degrees. Climate A humid subtropical climate with mild winters and hot moist summers is characteristic of most of Georgia. The average annual precipitation varies from about 40" in central Georgia to more than 75" in northeast Georgia. One of two annual precipitation maxima occurs in February or March, when between 4" and 6" of rain may be expected because of the high seasonal incidence of cyclonic activity over the southeastern United States. The second maximum occurs in June and July, when precipitation from thunderstorm activity may bring 4" to 7" monthly. Average yearly precipitation for Georgia, from 1971 to 2000, is shown on this chart from Oregon State University. The number of summer days when the temperature exceeds 90 degrees F are numerous, but in the mountain areas and the hilly Piedmont cool evenings bring welcome relief. Winters are mild, but significant variation occurs from south to north in Georgia. Snow cover lasting more than one or two days or exceeding 2" occurs only in the mountainous fringe of north Georgia. The great day-to-day variability in winter weather is caused by the interaction of polar and subtropical air masses. Atlanta's extreme low temperatures are rarely below 14 degrees F.